What was the mood like in Vancouver? Most of the people I know who live there sound pretty excited about the Games, but from your reports it sounds like there’s a bit of a debate about how much of an impact they’ll have in boosting the economy there? How much is Vancouver hurting due to the economic crisis compared with other parts of Canada? In general, the recession hasn’t hurt Canada as badly as the U.S. Canada’s unemployment rate is lower than the U.S., which bucks recent trends. Canada’s banks didn’t get involved in the sub-prime mess and other “creative” ways to make money. With regards specifically to Vancouver, its been spared the worst of the recession. “Lower British Columbia,” which is where the Olympics will be held, did not technically go into recession in 2008, when much of the U.S. was sliding into an economic downturn. There’s a strong argument to be made that that’s because of all the Olympic spending. While the construction industry had come to a standstill in the U.S., Lower British Columbia was busy getting ready for the Games, putting a lot of people to work. Are there any social issues you came across in B.C. that the city or province was trying to address before the games, such as homelessness, etc.? Vancouver has a notorious homeless problem. From what I can piece together, that’s due to two factors: the city’s welcoming attitude and its warm climate. There’s an area downtown just a few blocks from where the opening ceremonies will be held, which is a blight on the city. It seems that Vancouver’s civic leaders are split on how to deal with the problem. Do they sweep the city’s problems — which also include prostitution and drug-use — under the table or try and paint a false nirvana, as China did with its problems at the Beijing Olympics? Or should Vancouver let reporters see the reality and write about these problems? It seems that Vancouver has chosen option #2, which is a calculated risk. It can make Vancouver look bad. Or real, depending on your vantage. Do you think that could hurt coverage of the games, or are people mostly looking for the good sports stories and aren’t really focused on the other stuff about the city? Has the funding for the Olympics helped solved those problems at all? If you have more than 10,000 reporters fighting for stories, somebody is going to cover these problems. I don’t see that as a bad thing. It’s reality. I give Vancouver credit for talking openly about its problems. Vancouver is building an athletes village, which will later become public housing. As with everything related to Olympic spending, people are split on this too. The social housing was badly needed, but very expensive, partly because it was built in a hurry for the Games. But no, as far as I was able to uncover, little was done to address the city’s homelessness problem with regards to the Olympics. You did a great report on the Paralympics that follow the games — can you talk a little about how that works and if it was a smart idea for B.C. to bank on those as well? The Paralympics aren’t going to be a moneymaker, but I think it’s a nice story. Let’s be honest, the Olympics ain’t what they used to be — today’s Olympics are about sponsored athletes, some in professional leagues like the hockey players, competing in another competition. As a winter athlete myself, I love watching the Games. But for purity of sport and good feeling, the Paralympics are really nice. Unfortunately, they get little media attention. So no, the Paralympics won’t make money for B.C., but there are small bonuses like turning Whistler into a resort that is very friendly for the disabled. Calling myself a “winter athlete” might be a bit of a stretch, but I love to ski. I also love watching the bobsled and ski jump. Once you see those two events live in person, it’s hard not to become a fan. 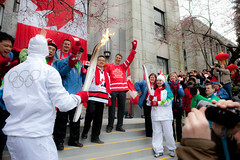 This entry was posted in Econstory, PRI: Podcasts and tagged canada, jason margolis, olympics, the world, vancouver on February 12, 2010 by Laura Hertzfeld.